Enter the Meet Justin Bieber sweepstakes for your chance to red carpet premiere of Justin Bieber’s new movie “Believe’ and a meet and greet with Justin Bieber in person! 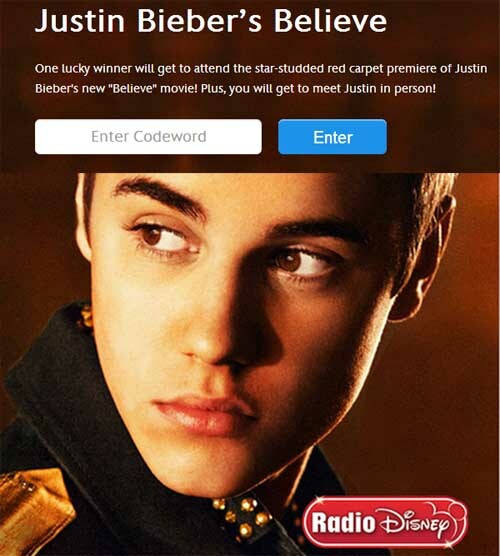 Listen to Radio Disney for the “Code Word of the Day” (sign in to RadioDisney and click on the “win” button then “listen for the chance to win” Link, entering the correct code (see official rules). Enter once per day (Daily sweepstakes) to increase your chance of winning! Enter this amazing Disney sweepstakes today and you could be the “one lucky winner will get to attend the star-studded red carpet premiere of Justin Bieber’s new “Believe” movie! Plus, you will get to meet Justin in person!” Sweepstakes runs until December 10th, 2013. “The Code Word of the Day is valid from 3:00 a.m. PT/6:00 am ET on the day it is announced on-air until 2:59 a.m. PT/5:59 a.m. ET the following morning.” Many a fan of Justin Bieber would love the chance to meet the super star in person! Enter the Disney Radio Meet Justin Bieber sweepstakes today. This is a great chance to win a trip and hit up the Red Carpet, I love Disney sweepstakes so much. Good luck..